For a long time, I was kind of a purist when it came to gardening: I felt that gardens should be about plants, not “stuff.” In many respects, that was just sour grapes; really cool garden art tends to be really expensive, too. Plus, I tend to get a wee bit obsessed with collecting things, so figured I’d stick with collecting plants instead of things. But then, wouldn’t you know: I got hooked on a new kind of stuff, and I have garden blogging to blame. More specifically, a garden blogger: Pam of the blog Digging, and her beautiful blue bottle tree. After hearing me natter on about Pam’s bottle tree for a while, Mom bought me a bottle-tree frame of my very own. 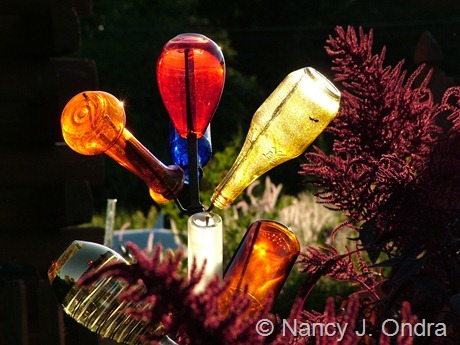 That started me on the hunt for neat bottles, which has since evolved into an appreciation of nice bits of glass of all kinds – not to display indoors, but to put out in the garden.